Based in the magnificent Somerset Levels, English Hurdle has revived the ancient art of hurdle making using specially grown willow withies. Above: Pruning living willow for a fence; kept wet, willow stays pliable;Nigel Hector, fifth from right, back, and son James, second from right, with some of their skilled staff; the many uses of living willow in the garden. The landscape of the Somerset Levels, or wetlands, is redolent of the paintings of Van Gogh. Pollarded willows scratch the sky with their fingers of new growth, reflections etched in the flooded meadows and wide ditches at their feet. This land has produced the best basket willow in Britain for the past two centuries. Between Taunton and Bridgwater is a thriving family business which for generations has been producing willows as a crop for weaving. Father and son team, Nigel and James Hector, run the business, English Hurdle, which was started by James's grandfather, Cecil. He bought an ancient farmhouse with 100 acres of land on the Levels and became a major supplier of withies for baskets, in great demand in those days. 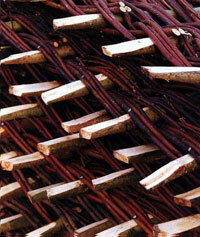 ‘The deep growing willow roots, which are cut to the ground every year, can yield multiple stems for 30 years’. The business has evolved and now is also successfully reviving the art of traditional hurdle making, for fencing and garden products. The range is impressive and includes rolls of hurdle "hedge", bought by the metre to form a living trellis, which can even have a window cut in it. If you fancy a bower seat, a secluded arbour, a wigwam for children, an arch for roses, a fan up a garden wall or a conical climber to support sweet peas and clematis, this is the place for you. The osier beds are clustered over the moors with outbuildings and barns converted into offices, workshops and a showroom. English Hurdle now employ 20 people, seventeen of whom make hurdles. Veteran hurdle maker Stan Dare is a grand old man of withies who came to the Hectors when he retired to teach the art, virtually resurrecting the ancient craftthe Romans used hurdles for boundaries and laid them down as track over the flooded Levels.